The original shapes of pallets are magical and different you can find it so true by peeking into the whole pallet recycling ideas! 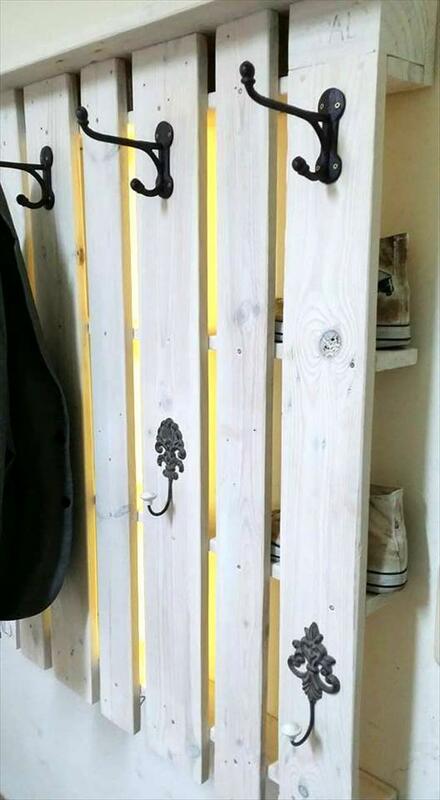 To get your engaged with awesome and easy pallet projects, we have shared this DIY rustic pallet coat rack with lights , is an all creative and most practical yield of pallets! It serves that targeted wall in too many different ways, first we would like to discuss about it incredible wall mount, the dice sectional facing the wall area are perform as hidden shelves or storage options, this way hanging of pallet board also gives a mantle level to display the decors like mural frames and art toys and above all is the front deck board section which has been got as a charming organizer due to addition of number of metal hooks! There is one more secret that just turns it into a charming wall art pieces, it is the addition of LED lights that can be selected in any light shade to satisfy your specific taste! The hanging section is what that introduces it as cool wall organizer and also as a coat rack! 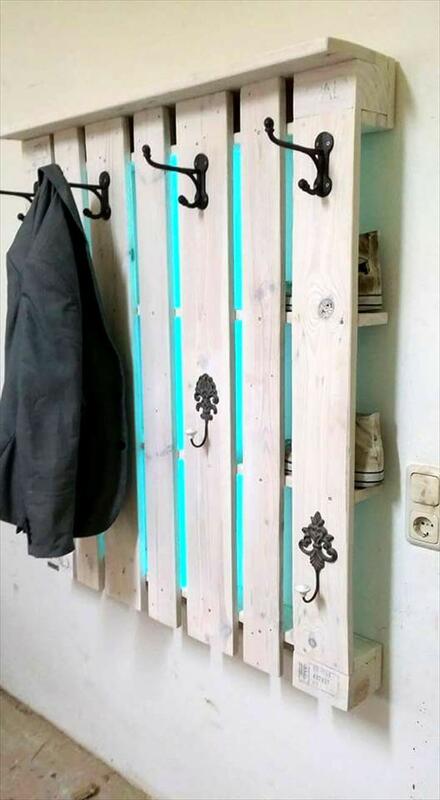 Copy to get unlimited pleasurable benefits of this pallet project! Here is to see a most functional behavior of one pallet board, given a stable wall mount and comes with a plenty hooks fixed over in random assortment! 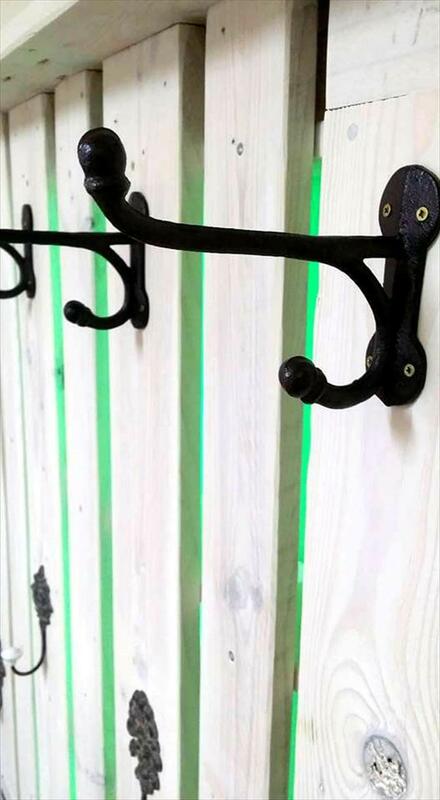 Double side hardware metal hooks have been chosen to install the very first row of hooks that are most stable and would come in handy to hang your coats and other comparatively heavy items! Using steel screws the hooks have been gained tight to a fixed place on the wall mounted pallet board! The lower artistic hooks with stylish white ends have also been installed in the same way! There is also a slat serving as the top mantle level, fixed right over the head of mounted pallet board! 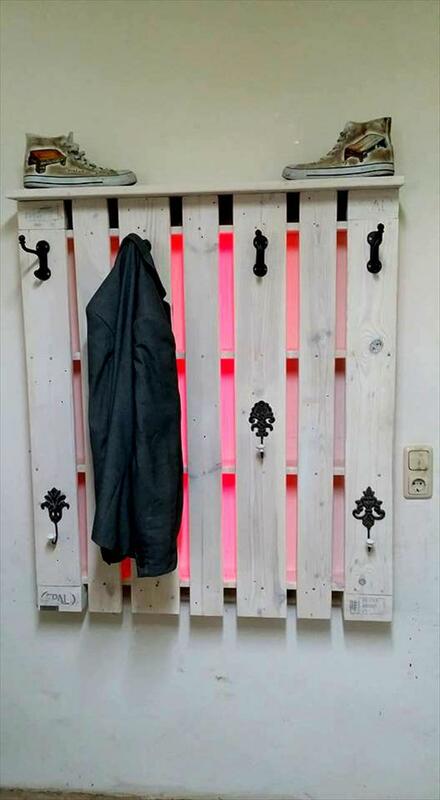 The backside planks of pallet board when touch the back wall surface, turn into amazing narrow storage options! 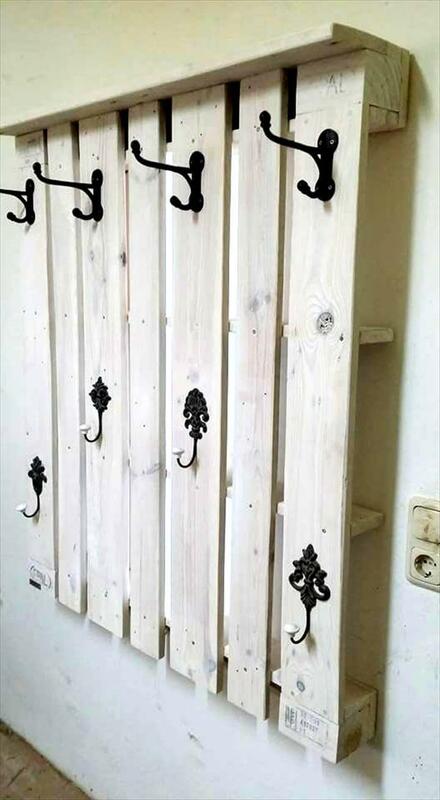 Hang your jewelry items on this lovely wall organizer and choose the higher shelving level to place your gloves and joggers! LEDs have been fitted inside to gain it more focally stimulating at night! here are love color inspirations you can choose to suit your wall decors or primary colors of your wall! 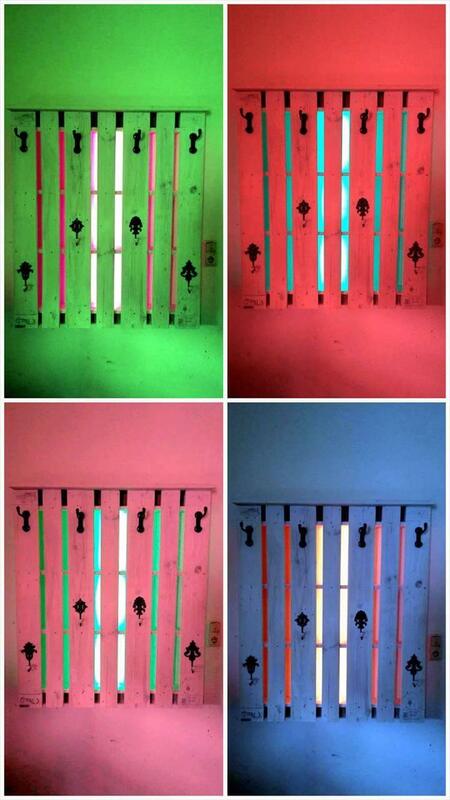 You can even chose different colors of LED’s to give variations to this wall organizer!